Cleans up to 4X Faster. The Power Broom is ideal for decks, patios and walkways. 4 nozzles create a 12 path for even and thorough cleaning. Quick change connector makes for fast and easy on/off. Compatible with: 2900 SpeedWash, 3200 SpeedWash, 3600 PRO, 3800 Belt Drive PRO models. Shipping Dimensions 15" X 8" X 15.8"
We used the broom a few days ago to clean the concrete in connection with a rear yard walkway and the device performed superbly. It cleaned the surface with great ease. I am overall pleased with the operation. You must do two passes to get complete cleaning using a 3000 psi pressure cleaner. I waited a very long lead time to receive the broom. I've only used it on my side walk so far. it only took about 45 minutes what would normally take about 3 hours. I looking forward to using it on my wood deck. And with different powers settings on my Generac 2900, i'm confident it will do a great job there too. Both the 2900 and the broom were a great investment. I bought this product with high hopes. It did not live up to my expectations. Its cleaning power is only OK at best and it leaves streaks as it cleans. You need to keep going back over the area to get the streaks. I went back to using the wash tip. The power broom cut the work time to clean our driveway and sidewalk . Since it took about one third of the time , I also saved gas for our pressure washer . Great time and money saver. This product is good quality and performs as advertised. First job was a trex deck that was 14 years old on the north side of the house. It started showing the original color almost immediately. Besides normal wear and tear it looks great. A nice even job without all the backsplash ! Well worth the money ! The customer service is really terrific also !! This is your one stop cleaning source !! Worked well on my brick pavers which were looking gray due to weather. Highly recommend this product. Works as advertised, saves a lot of time as there are 3 jets under the hood. Helps reduce lines when cleaning cement. Better than my gas power broom or a push broom. I used this product after I washed my patio, and it did a great job washing down the patio off after I used my new Generac surface cleaner to power wash my patio, it washed down the dirt, moss, and the gunk that the surface cleaner lifted off the patio. I was truly impressed. It did what the gas powered broom and standard push broom wouldn't do. The Power Broom is a helpful, handy attachment. I made power washing my deck easier because I did not have to hold the wand a distance from the deck surface. The Power Broom could rest on the deck and be pushed on the wheels. I think it would be helpful to have one more jet so that the edge jets are closer to the edge. I found the cleaning effectiveness to be limited at the edges. Absolutely a waist of money. I thought it would save time, better off sticking to a single nozzle. Easy to use, works as advertised. Best tool I purchased for my Power Washer. I cleaned my 1250 square foot red wood deck with the 12" Power Broom within 4 to 5 hours. It cleaned the surface down to the wood face removing all the green moss and black dirt. In the past when I used a power wash nozzle it took a day and half to clean the same deck, also using the Power Broom is easier on your arms and hands since it works like a vacuum, you never having to pick it off the deck surface. A great tool!!!! Great time saver and does a good job. Great product, reasonable price and it does a great job on my deck and my very dirty concrete. Q.Will the Power Broom be effective with my 2700 Generac? A.Thank you for contacting us. 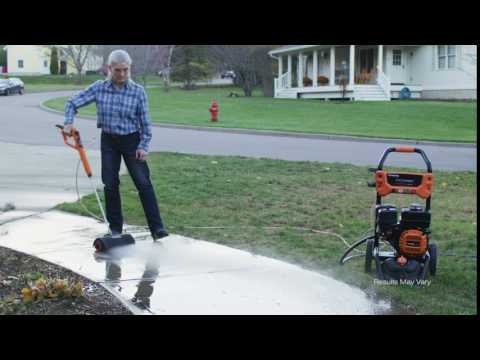 The Power Broom can be used with your 2700 PSI Generac Power Washer. It will work on units up to 4000 PSI with a 1/4" male quick connector. Please let us know if you have any other questions.